← What do you want to let go of? When I began meditating in 2004, it was a refuge for me as I navigated the stressors of life. It wasn’t always an easy journey, but I could see the positive change in my life as I practiced. Mindfulness took meditation a step further because it brought in the heart component. Before I taught mindfulness, I always worked from a heart-centered approach. I knew this, owned it, and treasured it. So when I learned that mindfulness combined being present in each moment with kind attention, it transformed my life. 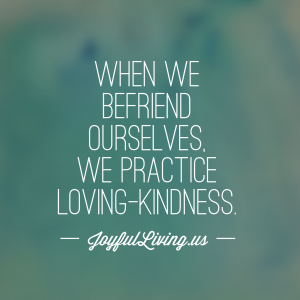 In the days of the Buddha, as he shared the importance of meditation he also talked about practicing loving-kindness. In traditional or ancient texts in Sanskrit literature this was called maitri, and was spoken about in depth. As I teach mindfulness, I am intentional to bring in the heart piece – the loving kindness – and what I’ve recently been referring to as, befriending. When we befriend ourselves, when we befriend our desires, our pains, our failures, our struggles, our journey… we practice loving-kindness. To some people, loving-kindness does not resonate. They find it too light, or too soft, and the words lose their power. So I’ve been experimenting with the concept of befriending. Because friendship is a visceral, often impactful, experience. How does this sound to you? I’d love to know which connects with you and how. And if you’re inspired to learn more, I recommend this Meditation on Loving Kindness. P.S. If you’re looking to cultivate more loving kindness towards yourself, I invite you to join me at my free Introduction to Mindfulness classes this Fall. Learn how they may serve you here.